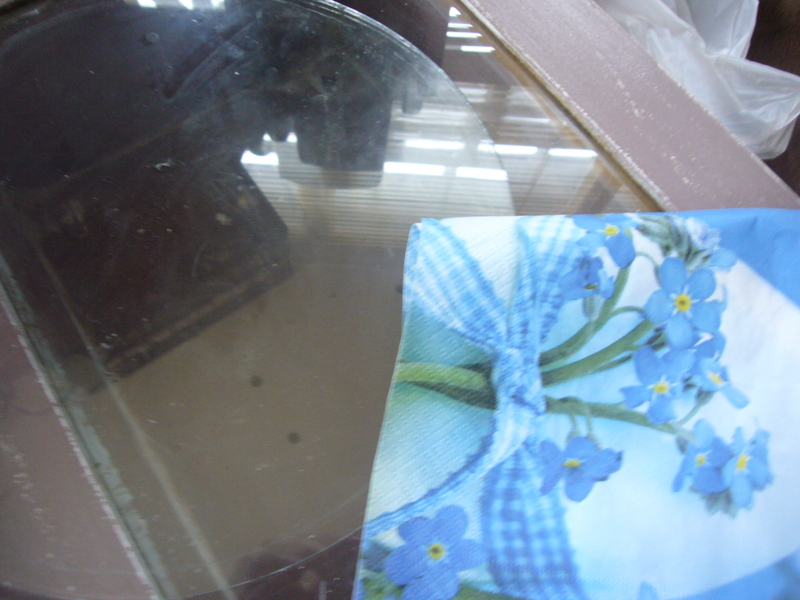 Here is the promised step by step glass picture decoupage how to. First, I removed all fat from the glass. I used a spirit based glass cleaner to do that. Then I used transparent polish to adjust the napkin pattern. You do all the decorating on the back part of the glass. So, you glue the napkin with the picture down to the glass, so you could see it through the glass. 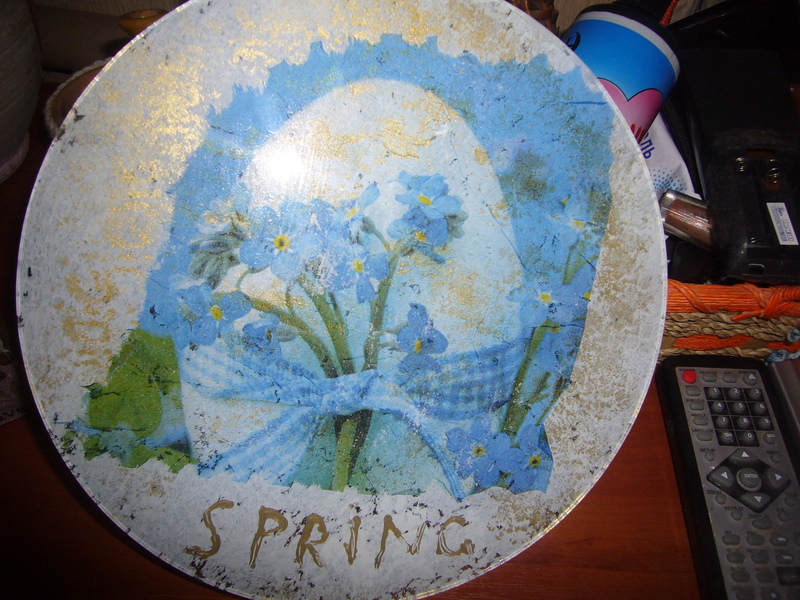 I let it dry and then added an inscription. I used some golden paint and my knitting hook to do that. Again, make sure to write ‘backwards’, so you can read the word properly, when you look on it from the other side of the glass. I let it dry up a bit. Then I took a soft tissue, dipped it into golden paint and sort of patted the back side of the glass with it. You can also use a dish washing sponge to do that.That is the first stage of my glass picture decoupage how to. Once the golden paint got dried up, I applied some white acrylic paint the same way, as I applied the golden one. You have to cover up the entire napkin pattern decoupage and all the back of the glass with it. The last stage of the glass picture decoupage how to is to cover up your decoupage with transparent polish. This would prevent your picture from getting scratched or damaged. This entry was posted in Uncategorized and tagged crafts, decoupage, decoupage how to, decoupage step by step, decoupaget ips, easter, easter decoupage, Easter home decoration: glass picture decoupage how to, glass decoupage, glass picture, home decor, home decorations. Bookmark the permalink.